British Turkey have challenged bloggers to invent an innovative dish using British Turkey as well as 2 non-meat ingredients which are Red Tractor approved. As regular readers will know 'The Brilliant Chef' refers to 7 year old Daniel and whenever mum's in the kitchen, disaster usually ensues! However, I hope that I have done Daniel proud this time as this dish really did turn out amazingly well. 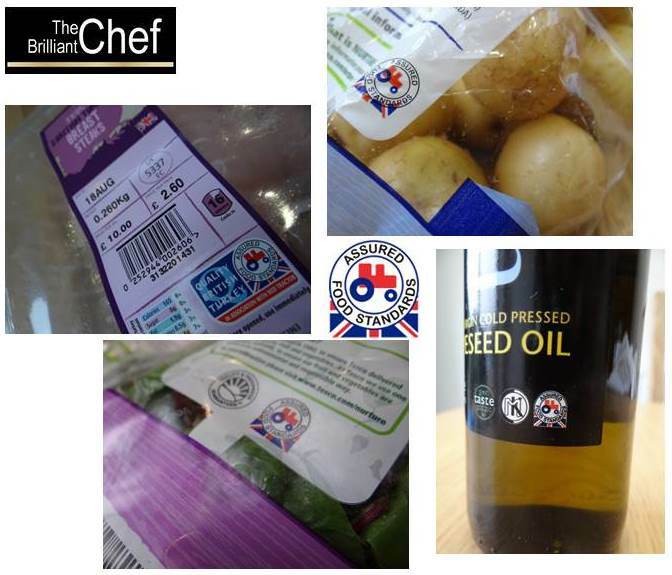 The benefits of using British Turkey, (as well as being Food Standards Assured with the Red Tractor logo!) are that it is low in fat, can hold big bold flavours really well (hence my recipe idea to include tikka) and is a great value meat. Some Hillfarm Rapeseed Oil (Red Tractor), the juice of a lemon and a spoonful of wholegrain mustard mixed together makes the perfect dressing for the salad. 1. Cut each of the British turkey breast steaks (Red Tractor) into two or three pieces. Marinate the turkey breast steaks in a few spoonfuls of tikka paste. (If you don't have time to marinate, then lightly score the turkey breasts and rub the paste onto both sides). They can be left to marinate in the fridge from anywhere between half an hour to 24 hours. 2. In a frying pan or griddle pan, seal each piece of turkey. You won't need to add any oil into the pan as the tikka paste will prevent the turkey from sticking to the pan. 3. Cut the filo pastry sheets into smaller pieces. I cut each sheet into 4 rectangles. You will need enough of these smaller rectangles to have around 4 'layers' on each parcel. 4. Melt a little of the Red Tractor butter to brush onto each layer of the filo pastry. You really don't need too much butter - just enough to give a very light brushing to help crisp and brown the filo pastry (in fact, too much butter can prevent it from crisping up properly!) One of the benefits of turkey is that it is a really lean meat so I didn't want to add too much additional fat into this recipe. 5. Put a small spoonful of mango chutney into the centre of your first filo rectangle. Then wrap each piece of the turkey into a parcel using the filo pastry. You will need around 4 layers per piece of turkey. See my video above if you are not sure how to do this. It really is easy to do but looks really nice once done! 6. Pop the parcels into the oven at 180 degrees (for fan ovens) or 200 degrees (non-fan assisted ovens) for 20 minutes. 7. Whilst the Turkey Tikka Parcels are cooking in the oven, you should have plenty of time to put together your Orange and Fennel Salad which will perfectly complement your Turkey Tikka Parcels. Our whole family usually cannot stand fennel - but you will need to trust me on this, combined with the oranges in the salad and a drizzle of the dressing, the fennel ends up tasting great! Simply mix together the bag of lettuce (Red Tractor), some sliced fennel - cut the bulb (not the feathery leaves) into pieces to add to your salad, the segments of an orange (no peel or pith - just the juicy segments) and a handful of sultanas. 8. Then drizzle on the dressing (made from a little rapeseed oil which shows the Red Tractor logo, a spoonful of wholegrain mustard and the juice of 1 lemon). Then your dish is ready to impress your family and friends with! This meal turned out so well that I am planning to cook it next time we have guests over. If I haven't managed to convince you about having fennel in your salad then you can always swap the salad for some (Red Tractor) veg instead! This is my entry into the British Turkey Blogger Recipe Competition. This recipe was created by The Brilliant Chef's mum, Rebecca, who is not a brilliant chef but has been inspired by her little boy to 'have-a-go' in the kitchen and occasionally manages to surprise herself by coming up with something that actually tastes good and is great to make! Disclosure: We were given £15 towards the cost of ingredients to create this meal.